Happy Christmas Eve to my friends across the pond. When you’re done eating your figgy pudding, then curl up next to your yule log, break out your old wooden chess set and check out this winter-time puzzler. It’s white’s move and black has a win. Can you find the correct procedure? The solution is below. First we need a plan, and here we need a little bit of theoretical knowledge as a basis. Two lone knights cannot checkmate a king by force unless the defender allows it. The defender can employ a stalemate defense quite easily. Because the pawn, when freed, prevents a stalemate, the inferior side’s extra material works against him here. At the proper time black must release the blockade and free his knights up to give checkmate. If black captures this wandering pawn it’s a draw. If he lets the pawn reach the queening square he must make a capture, or checkmate white on the subsequent move. The further-advanced the pawn, the easier the defense. The Troitsky line dictates whether the situation is winning or not. It’s an eyebrow-shaped line connecting a5, b3, c4, d5, e5, f4, g3, h5 (reverse it if you’re white). 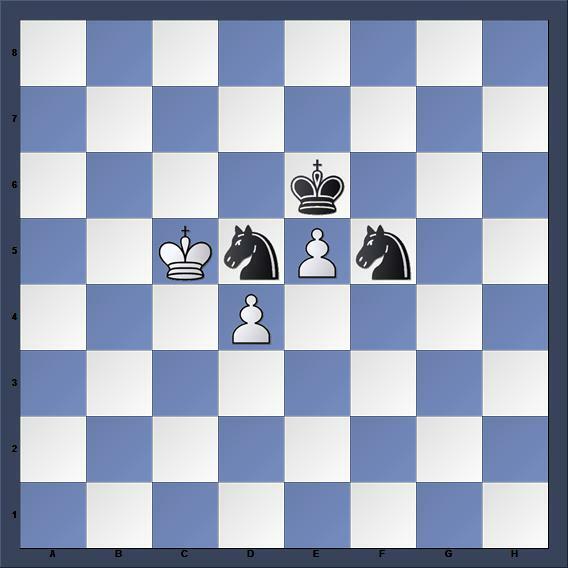 If the blockaded pawn is on or behind this line it’s a winning position. Both white pawns are on behind the Troitsky line here. Black should leave only one knight on blockading duty, or else the winning side cannot make progress against the king. The attacking procedure against the pawns is a bit ungainly. Winning it involves the use of zugzwang; black should try and separate the pawns. This makes their defense harder for the king. Don’t let the d4 pawn move though. Here’s how I handled this portion. It gave me great pleasure to see Fritz fail here. Speed is not all that important and I don’t believe my way is fastest. Get the d-pawn by itself and the forward pawn will soon fall. The next part involves herding the king. I find this difficult. Aim for this. 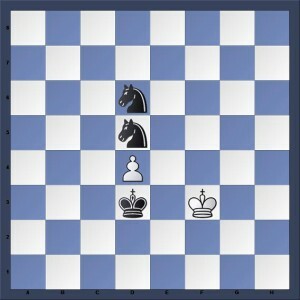 The two knights are on opposite colors and create a blockade. The white king cannot cross back to the other side because d7 and d8 are protected. To find out how to finish (albeit, from a slightly different position) this video is a great resource.